There’s nothing more frustrating than having a gift to give and not enough people to give it to. The truth is, just being a great coach isn’t enough anymore. You can't just get a few clients and then focus solely on coaching them. If you want to be able to support yourself financially, you’ll need to have a steady stream of clients coming in to replace the ones that leave. What if I told you that you could get 3-5 conversations scheduled this week with people willing and able to invest in your coaching? It's totally possible, but only if you follow the right steps. There are four steps are what allowed me to connect with potential clients and break six figures in my business. And I’m about to walk you through each one of them. This is one of the most important steps you can take towards building a thriving coaching business. Most coaches waste a lot of time and energy going after people who are never going to be a good fit for their programs. You're not like most coaches. You’re going to be picky. You’re going to get really clear on who you’re looking for and ignore everyone else. Why? Because it doesn’t matter how many conversations you have scheduled if none of them are with qualified prospects. What I want you to do now is get out a piece of paper and draw a line down the middle. Create two columns. One one side, you’re going to write “seek out” and on the other side you’re going to write “push away”. Then I want you to start plugging in the characteristics, demographics, and attributes of your ideal clients on one side and their opposites on the other. If you’ve already worked with a number of people already, you can use the commonalities of your favorite clients as jumping off point. Which ones were the most eager to pay, the most enjoyable to work with, and the best success stories? We’re going to try and multiply them. What types of people are those three things true for? What else is important in order for you to do your very best work? Answering these questions will help you figure out who is hungry for what you offer. There’s another reason to be picky and it goes beyond just knowing who to look for. When you’re discerning, potential clients can sense that you are clear about what you want. And clarity is attractive. When you aren’t focused on who you’re here to serve, you end up attracting people who are unfocused. And you don’t want to attract those people. Coaching businesses are built on relationships. And as with any relationship, you benefit more from knowing what you want than you do from chasing after anyone who might like you. Let’s use the example of dating. Some people try to cast a wide net when looking for romantic partners. But casting a wide net is usually driven by a scarcity mentality (the belief that there aren’t enough people who would want you). You only cast a wide net if you think that you can’t afford to be picky. In our dating example, there are a couple of problems with casting a wide net. First, it makes you look desperate. Second, even if you don’t look desperate, the people who you really want to date see you with all of the other types of people and they don’t want to date you anymore. When I was in college, I mentioned to one of my female friends that I wanted a longer term relationships. As soon as I got clear about the type of relationship I wanted and the type of person I wanted it with, I met my future wife. The same thing happens in business when you try and go after any potential client who might pay you. The people you want as clients see you with your non-ideal clients and assume you’re not the right person to help them. And they make themselves invisible to you. So, look back at your list now. Do you trust that there are enough people in the “seek out” column that you can truly ignore the people in the other column? You might think that you have to wait in order to be discerning. But that’s not how it works. You need to start being picky now. Most coaches are reactive in their marketing. They try to make themselves look more attractive by working on their website and hope that potential clients come to them. If that’s what you’ve been doing, let me ask you a question: how’s that been going for you? Just like you are unlikely to get dates if you’re sitting on the couch watching Netflix, you’re unlikely to get clients if you’re not proactively seeking them out. You need to set yourself up for success by putting yourself in places where a connection is likely to be made. I want you to look back at the two column list you created in the last step (you did create it, right?). Where are those people hanging out? Where have you met them in the past? Live events. Retreats, conferences, and intensives are some of the best places to meet clients because a) you can make a real face-to-face connection that builds trust and b) if they are paid events, you know that the people you meet there are willing to invest in that area of their life. Facebook. You can use all sorts of social media channels to connect with potential clients, but I like Facebook best because it is the online equivalent of a live event. You can walk in at any time, find the groups that your potential clients are in, and connect 1:1 through the messenger feature. It’s also a great place to follow up with people you’ve met at live events, especially if you are posting valuable content there regularly. Email list. If you do any sort of online marketing via a blog, podcast, or webinars, then you already know the importance of building an email list. While I personally think that most people put too much focus on list building, your email list can certainly become a valuable asset for finding clients over time. Of course, it’s not enough just to have a list. You’re going to have to hold webinars, send them to a work with me page, or put out free strategy session offers in order to connect more deeply with members of that list. Keep in mind: the places that work for me might be different than the places that work for you. It’s important to try a bunch of things out. Then you want to focus only on the highest leverage activities - the ones that consistently get you committed clients. So, where else can you go to find potential clients? A hint: people mostly hang out with people who are like them. Which means that your potential clients are probably already hanging out with your current clients. This is why referrals are such a powerful source of new business. One of the best dating tips I ever got was to make friends, just friends, with someone that is like the type of person you would want to date. Why? Because people hang out with other people like them. So if you put time into that friendship, the person will want to set you up with their friends. You can use this same type of thinking to get clients by helping people out for free with no expectation of an immediate return. What most people do, once they meet a potential client, is try to prove themselves. They feel the need to explain what they have to offer. A much better – and less nerve-racking – strategy is to focus on what the other person wants. The best way to add value to someone else is to start by being curious. This is true whether you are going to a live event, connecting with people on Facebook, or holding a webinar. The first thing you need to ask is: what’s going on in this person’s world and how can I support them? Only after you’ve asked them questions about themselves should you worry about establishing credibility, explaining what you do, or inviting them to a consultation. To use our dating metaphor, this is the equivalent of asking someone for the time instead of walking up to them and asking if they want to marry you. The first strategy plants a seed that might become something. The second strategy is 99.9% likely to get you rejected. All relationships follow a certain sequence of steps. If you skip a step, it’s natural for the other person to slam on the brakes. If you’re feeling scared of rejection, it’s a sign that you haven’t gotten a good enough sense yet about whether you can help this person (and if the person even wants to be helped). The only way you can find that out is by getting curious first. This is the wrong way to be curious. Ask them specific questions about their life or business so that you can see if they might be a fit for what you offer. Your two column list comes in handy again here (if you haven’t done it yet, do it now) because you can start to gauge which column this person falls into. If they fall in the “seek out” column, you’ll know to spend some extra time with them. If they fall in the “push away” column, you’ll know that they are unlikely to ever become a client. The “push away” column might seem harsh, but it’s important that you’re really clear about who you are best equipped to help. It doesn’t serve either party to string someone along when there is no real potential for a business relationship. You don’t want to have an awkward “let’s just be friends” moment later on. When you talk to potential clients about what you do, you shouldn’t be giving a canned elevator pitch. You’ve just spent all this time asking them questions, so make sure you use the information you just got to meet them where they are. Well, you could explain what you do by giving a case study of someone you’ve worked with who was in a similar situation to the potential client you’re talking to now. You could explain what you do in terms of the problems you solve, if they are problems that the potential client you’re talking to now is facing. You could explain what you do in terms of your mission, if that mission is something that will resonate with the potential client you’re talking to now. I’ll use myself as an example, since we’ve technically been having a conversation as you read this post. I help coaches fill their client roster so that they can make more money and give their gifts to more people. Notice how I’m having a dialogue with you in this post even though we’re not actually interacting live. That’s because I’ve worked with a lot of people like you and I’ve asked them a lot of questions. So I already have a pretty good sense of where you’re at. You’ll need to do the same thing if you’re speaking to more than one person at an event or on a webinar. Or if you’re creating a piece of content online. Everything you do can be treated like a two-way conversation. You might be tempted, after you make a really great connection with someone, to put the ball in their court by letting them follow up with you if they want to learn more. And sometimes that’s the right thing to do. But usually it’s a much better idea to invite them to take the next step. Only you can decide what that next step is. To use our dating metaphor, it might mean asking that person out on a date. It might just mean getting their number so that you can stay in touch. You have the same two options when you interact with potential clients. You can either invite them directly to a conversation (also called a strategy session or consultation) or you can get their email and follow up with them later. The one that you choose will be based on how deep of a connection you’ve made so far and how enthusiastic they are about the problem you solve. How do you know if a potential client would even want to work with you? You don't. But if you listen carefully you can get a pretty good idea of how receptive they would be. Whatever you do, you need to know that it’s your responsibility to move this relationship forward. It’s not enough to just give them your card and hope that they get in touch with you. This doesn’t mean you should be pushy, it just means that you need to be willing to lead. The best way to do this is to choose a very specific way you can add value to them and offer that. Do you have something you’ve written specifically about their situation that you can send along? Do you have something you can talk to them about that will help them get more clarity about their situation? Whatever it is, make your offer customized to the person in front of you and showcase the benefits. If you want to ask someone out on a date, and they’ve just told you they like the zoo, which do you think is going to be more attractive? Obviously the first one is more compelling. The first one is generous. It’s coming from a place of trying to give, not take. The second one seems like it’s being generous, but it’s actually not. You’re making them do all of the work to figure out how you can help, and then making them reach out to you. Another option is to get their email in order to follow up with something specific and useful. They key is using what you’ve found out about them in the last step to figure out how you can best support them. 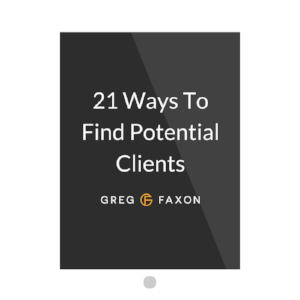 The “21 Ways To Find Potential Clients” PDF I offer at the end of this post is an example of that. If you decide to go this route, you still want to follow up by email or text and invite them into a conversation. Getting them on the phone is what ultimately gets you paid. We've just inserted an extra step to build more trust and rapport. If you consistently apply the first four steps, you’ll eventually have a calendar full of people likely to invest in your coaching. And from there you can focus on converting those conversations into paid clients. Having a coaching business is incredible. It allows you to make as much money as you want, work intimately with people, and see the impact of your work directly. But you only get to do that work if you can consistently get in front of the right people and convert them into clients. And yes, this means going beyond just coaching. You're going to have to create content, put yourself out there, and engage with potential clients. It doesn’t matter whether you’re doing this in person or online. At the end of the day, you need to build relationships. That's just part of the deal. Once you’ve downloaded the PDF, pick one to try out and see how it works for you. Over time, you’ll start to notice which strategies you enjoy the most that also yield the best results. Let’s be honest: sometimes we make the process of getting clients more complex than it has to be. If you follow the four step formula outlined in this post, and keep doing them consistently, you’ll soon have more clients than you know what to do with.